What is the acetabular labrum? The acetabular labrum is a tough cartilage which attaches about the rim of the hip joint socket. The labrum deepens the socket and assists in the stability, lubrication and sensation of the hip joint. 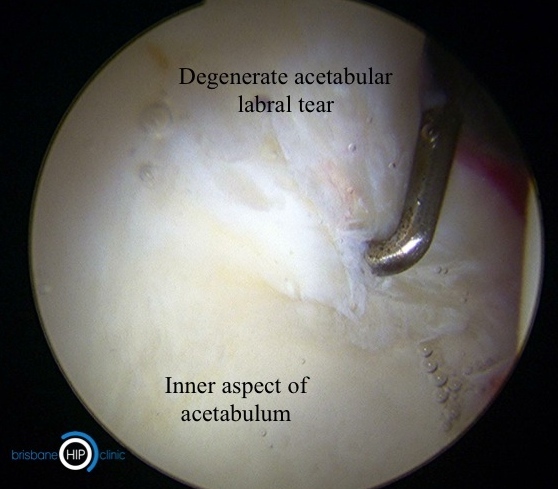 What causes acetabular labral tears? Acetabular labral tears generally occur in two situations. More frequently, labral tears may occur due to a gradual accumulation of damage over time - this is known as a 'degenerate tear' (Figures 1-4). Degenerate labral tears may develop as a part of hip joint osteoarthritis, or may be related to other hip joint disorders such as developmental dysplasia or femoro-acetabular impingement (FAI). Acetabular labral tears can occur as a result of a single traumatic injury to the hip joint - this situation is reasonably uncommon (Figure 5). Patients with acetabular labral tears commonly experience groin pain, which is often made worse with physical activity such as impact sports, running and positions where the hip is deeply bent, such as squatting or when rising from a low chair. The symptoms may have been present for a long time in a fluctuating manner and may have been misinterpreted as 'recurrent groin sprains'. Some patients experience 'mechanical' symptoms such as painful catching or unpredictable 'weakness' and giving way of the hip. Are there any other associated injuries? Patients who have developed a degenerate labral tear may also have associated damage to the adjacent gliding surface (hyaline) cartilage of the hip joint socket. Sometimes small cysts form around the hip joint as a result of the acetabular labral tear. 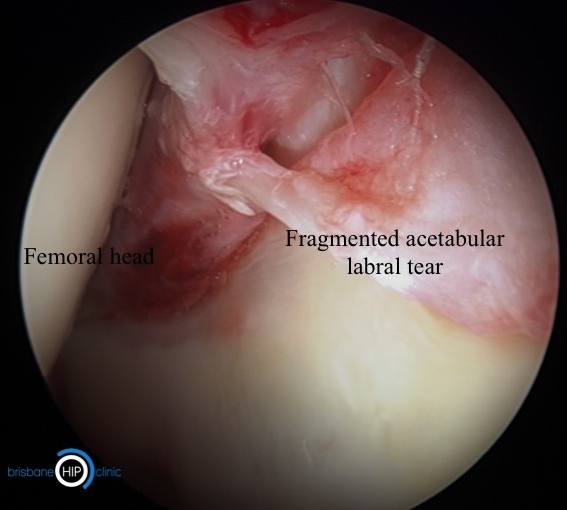 Patients who have an structural cause for their degenerate labral tear (such as dysplasia or femoro-acetabular impingement) have an underlying abnormality in the shape of the hip joint which has pre-disposed the labrum to accumulating damage. What about labral tears and arthritis ? Osteoarthritis is a condition that effects the whole joint, not just the labrum. It is typical for degenerative tearing of the labral cartilage to be observed in association with the development of osteoarthritis. Whilst labral tears may contribute to the pain associated with osteoarthritis, the far more significant factor influencing outcome is the degree of wear sustained to the hyaline (gliding) cartilages lining the joint. In circumstances of significant osteoarthritic wear, treating the labral cartilage tear alone is very highly unlikely to make a worthwhile impact upon the symptoms. For this reason, arthroscopy is rarely recommended for the management of osteoarthritis of the hip, even if a labral tear is observed on MRI. If the degree of ostearthritic wear is of lesser grade, arthroscopic treatment of the labral injury may be effective in reducing pain. Many patients with early hip joint damage can manage their symptoms without requiring surgery. Often this involves a number of techniques such as activity modification, musclular conditioning (for example with a physiotherapist or pilates instructor) and intermittent use of anti-inflammatory and analgesic tablets. For persistent symptoms acetabular labral tears can be accurately evaluated and treated with hip arthroscopy (key hole surgery). For patients with a structural abnormality of the hip joint, consideration can also be made to correcting the underlying cause for the labral tear. Figures 1-4 Images of acetabular labral pathology identified during hip arthroscopy. 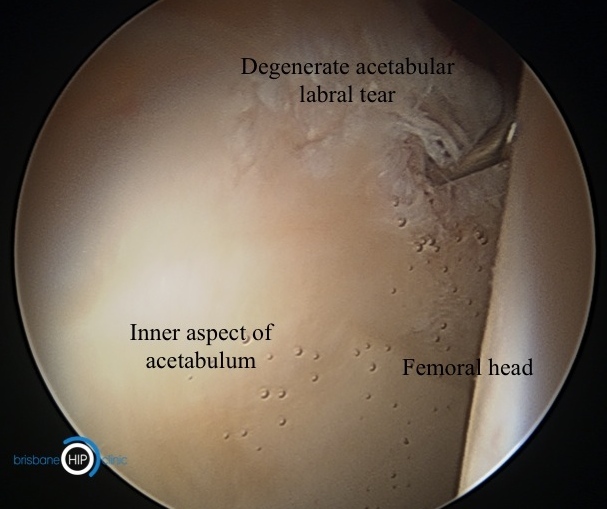 Typical acetabular labral tears are "degenerate" in nature - they demonstrate evidence of chronic (longer standing) "freying" of the labral substance. This explains why many people with symptoms from a labral tear have no clear history of an accident or single traumatic event - the labral damage has accumulated slowly over time. People will describe "recurrent groin sprains" fluctuating over many months or years. Sometimes a discrete portion of a degenerate labrum will also sustain an acute split with a sudden increase in symptoms. 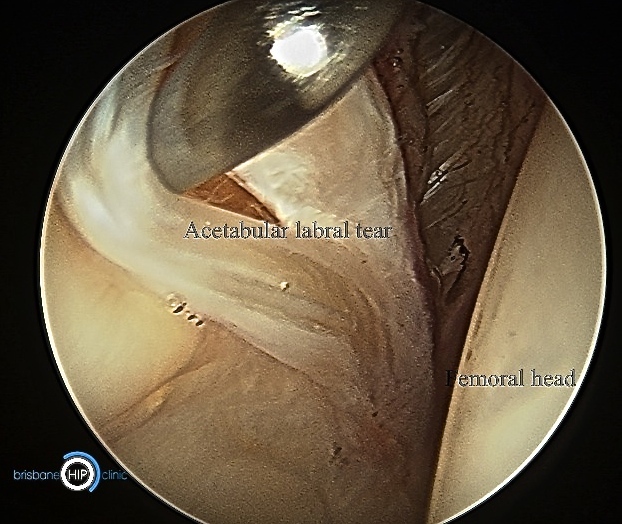 Typically what would appear as only relatively minimal trauma can result in an "acute-on-chronic" labral tear if the tissue is already degenerate. 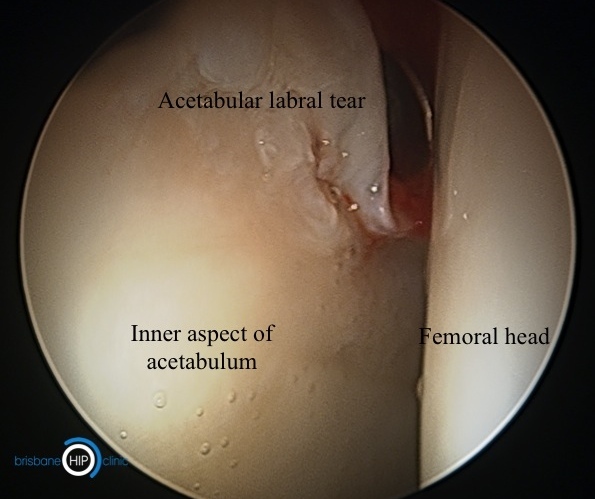 Figure 5: Arthroscopic image of an acetabular labral tear demonstrating a relatively unusual pattern. In this situation there is minimal degenerate change observed within the labral substance with a discrete slpit in the labrum due to more significant trauma. Labral tears in the absence of some degree of predisposing degenerative change are a relatively uncommon finding. This information has been written by A/Prof Patrick Weinrauch for the purposes of patient education. The details provided are of general nature only and do not substitute for professional recommendations based an individual clinical assessment. © A/Prof Patrick Weinrauch. Brisbane Hip Clinic.